There are sound environmental reasons to switch to cloth nappies but those reasons can often seem quite far removed from our every day lives. With local councils increasingly moving to fortnightly rubbish collections and reducing the size of wheelie bins, one aspect you can't fail to see is waste reduction at the household level. Sometimes, families with young children will have an over-flowing wheelie bin at the end of week one, with another week of rubbish still to go! 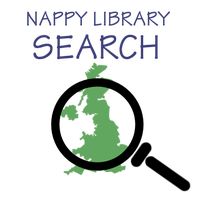 Switching to cloth nappies full time can reduce your rubbish by three bin bags per fortnight (per baby! ), leaving plenty of room in your wheelie bin. ​If full time isn't something you feel able to do, how about part time? Make one in every three nappies a cloth nappy and you've reduced your bags to two per fortnight. TOTAL for 1 year = 2366 nappies. 60L is a fairly standard size for bin bags. When filled with used nappies, any more than that is too heavy to lift or the bag is likely to split! A bag of 30 used disposable nappies (each tightly rolled with wet-wipes in a disposable nappy sack, with poo tipped out) averages 60L. 2366 nappies will fill around 79 bin bags (2366/30). Many people have fortnightly bin collections, so 79 bin bags averaged over a year of collections (26 collections), is 79/26 = 3 bin bags per fortnight. Of course, the number of nappies used varies as the baby gets older. 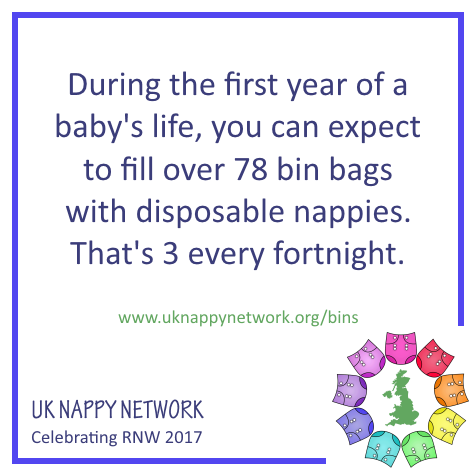 An older baby won't fill as many bin bags but a younger baby will fill more - from 0-6 months, you can expect to fill 48.5 bin bags with nappies, which is 3.7 bags per fortnight. If you have the smaller wheelie bins (140L or 180L) 3 bin bags of nappies will fill or overfill your bin, without any other rubbish in there! These figures are based on the lower estimates for nappy usage. Actual use may be significantly more.